Very rare obscure, minimal, synth LP, in a similar vein to Klaus Schulze, Richard Wahnfried, Sky Records, etc.15 tracks of arpeggiated synths, pulsing rhythms, with "Pages" standing out with it's Baldelli / 'Cosmic' Proto-Italo-Disco sound. stunning, with lots of other good tracks.Rumours of some Peter Baumann involvment here! this is exactly what i was talking about when i commented before about being interested in seeing more space-y, cosmic early electronic dance music... it is such a rich vein to tap that is often overlooked, but often enough, those artists were pioneers in their field. Exxxellent stuff !!!!!!!!!!!! I don't know if Peter Baumann really was involved in this record, but it surely sounds like he was. Same kind of sounds, same beats... This one could be Trans harmonic nights outtakes. Must be pretty rare, as The Crack In The Cosmic Egg don't even mention it. Thanxxx !!! Thanks ONCE AGAIN! another surprise! Being officially reissued on Medical Records around Feb 2012. Medical Records did indeed release the Axxess album earlier this year and I have waited and waited for a digital download version (as they often do with their releases) but it seems one is not forthcoming - and as the album has sold out, I think it would be more than reasonable to repost the rip (especially given the fact I have lost my rip!). "Axxess is the brainchild of French multimedia artist Patrick Mimran. Mr. Mimran was co-director of Lamborghini Motors (along with his brother) at the time and fittingly released the album on the imprint Lamborghini Records. Heavily influenced by German electronic pioneers Klaus Schulze, Tangerine Dream, and Kraftwerk, Mr. Mimran commissioned the German engineer Andreas Bahrdt to build a custom complex synthesizer which eventually materialized into a 16 voice analog synthesizer of genius proportions. Andreas had previously designed a less elaborate prototype for Peter Baumann of Tangerine Dream fame. 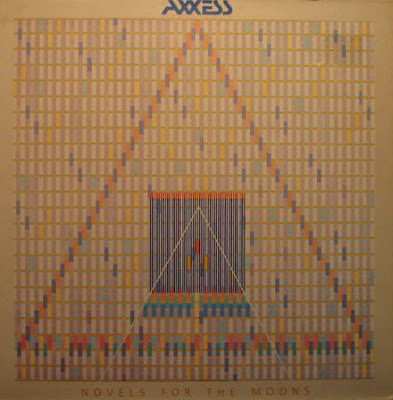 What then came to life as the product of Patrick’s imagination and this unique machine is a spectacular array of 15 sequenced instrumentals that is “Novels For The Moons”"